Aunt Leisa, Uncle J, and Emma-Kay. The things you do for a steak dinner..lol. They give you a steak dinner here the night before you go home. So last night we had steak, baked potato, cheese cake, salad, sweet tea, and sparkling grape juice..YUMMY!! Doots said "yuck" and asked for a pizza at the subway downstairs. 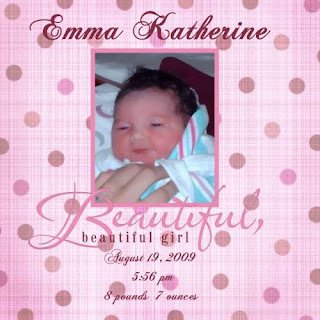 Emma-Kay.,..she looks so much like her Daddy. He marks them every time..lol. Her Daddy is very handsome to me and so I don't mind in the least that she looks just like her Daddy. Doots was going stir crazy up here after school. So I decided to build her a fort and let her watch Airbud on the laptop under it. It's okay for her to be bare foot. I know that would creep some out being we are at a hospital. But, Barry works here and assured me it was okay..plus, I watched them mop yesterday morning in here. Big sister helping out. You should see her..she is johnny on the spot to help out with Emma. She grabs everything she thinks Emma will need. So far there hasn't been any jealousy. She has been super protective though. Of course we have not taken Emma home yet either..lol. Doesn't her hair and skin just look like a painted baby doll's? She just looks like a baby doll to me...even at 8.7 pds she just seems so tiny. Doots trying to make another funny face..lol. Look at my two beautiful little girls. She looks so peaceful in this picture. I LOVE this photo. Look at that big smile on Doots' face. She is so proud to be a big sister. Today she gets to wear her "I am the big sister" shirt to school and take cupcakes for her whole class to celebrate Emma's birth. Her Daddy is also copying her off a picture this morning so she can take it with her to show all her little friends. My Mom got to meet Emma for the first time yesterday. So this is my Mom...Nana and Emma Kay. My Dad has gotten more sick over the past month and recently he is unable to go anywhere without oxygen. So he was unable to make it. But, he calls daily to check on his Emma Kay. I am going to do a semi picture blog today. I am really hoping I get out by lunch today. I think it really depends on my blood pressure. Yesterday it got up to 198/112!! That really scared me and so they are keeping a very good eye on it. They think it is either my uterus pushing on my aorta or fluid on me. I did have a lot of swelling and gained 50 pds with this pregnancy. Also, please excuse my appearance..I had a bad case of melasma with this pregnancy. So right now my blood pressure is averaging out 140s/80s. So that is a significant change from the highest reading yesterday. I would really love some prayer on the matter and I have a good feeling that today it will keep coming down. I think worrying has a lot to do with it too and I am a worry wart. I just really would love to go home today. Everyone else is doing great! Emma Kay is such a great little trooper and so easy going. Doots has fallen right into being a big sister with no problem. I thought maybe jealousy would be a factor and so far she is just extremely protective over Emma right now. Of course we have not brought her home yet either:) Barry is doing a wonderful job and he has been such an encouragement. He has been having to handle things at home alone. Last night was my first night here by myself and I really did feel so lost. I just fed Emma Kay, rocked her, and admired how beautiful she is. It's amazing the gifts the Lord give us..my family is definitely a blessing and such a wonderful gift from him. I can not imagine my life without them.